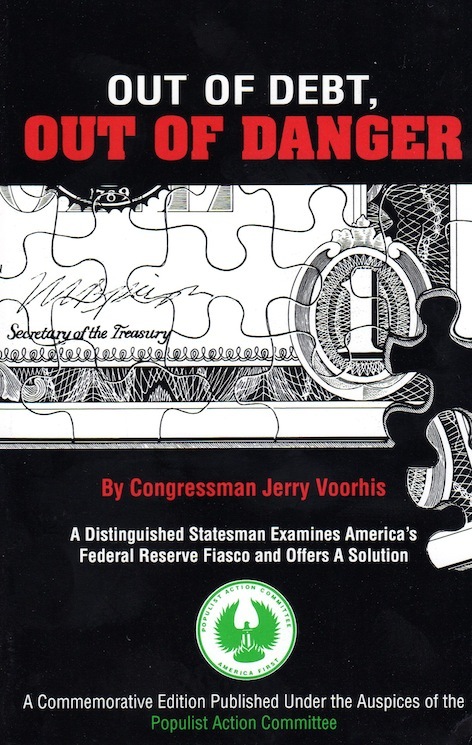 If Rep. Jerry Voorhis (D-Calif.) were in Congress today, there's no doubt that he would be leading the fight to audit and abolish the privately owned Federal Reserve banking monopoly. A committed anti-communist who called himself a "Christian socialist," Voorhis was wise to the usurious reality of the Federal Reserve money monopoly. In 1943 Voorhis went so far as to write a stirring indictment of the Federal Reserve System. His work was entitled OUT OF DEBT OUT OF DANGER. In the pages of this amazing study, Voorhis reviews the history of the Fed and how it impacts upon American life to the detriment of this country's farmers, workers and small businessmen. According to Voorhis, "The Fed does not act as a government instrumentality of the nation, nor are its policies and practices determined with the welfare of the nation in mind. Instead of that, the banks and bankers run the Fed and run it for the benefit of the financial community in almost every respect. Money creation, is the greatest economic power known to man. That power ought always to be exercised in the interest of all the people, never for the sake of private gain or a privileged few. The banks, commercial banks and the Federal Reserve, create all the money of this nation, and the nation and its people pay interest on every dollar of that newly created money. This means that private banks exercise un-Constitutionally, immorally and ridiculously the power to tax the people. For every newly created dollar dilutes to some extent the value of every other dollar already in circulation. A Federal Reserve System brought under control by the elected officials of the United States (1913) could be run in the public interest instead of in that of the money-lending community as is now the case."